John Russell is one of Australia's most fascinating late 19th century artists, unique in his engagement with the French avant-garde during a time of rapid change and charged debates about the nature of art practice. After leaving Sydney in 1881 and first enrolling in the Slade School of Art in London, he moved to Paris in 1884 enrolling at the Atelier Cormon where he formed a close friendship with fellow student Vincent van Gogh whose portrait he painted in 1886. Russell and Van Gogh are both painting in a tonal naturalist style while at Cormon's and there are close proximities in their practice in 1886/87. In 1886 Russell also met one of the protagonists of the Impressionist movement, Claude Monet, on the island of Belle-Île-en-Mer off the coast of Brittany. Monet allowed Russell to observe him at work outdoors on the cliff tops and in front of the tempestuous seas that characterise this coastline. 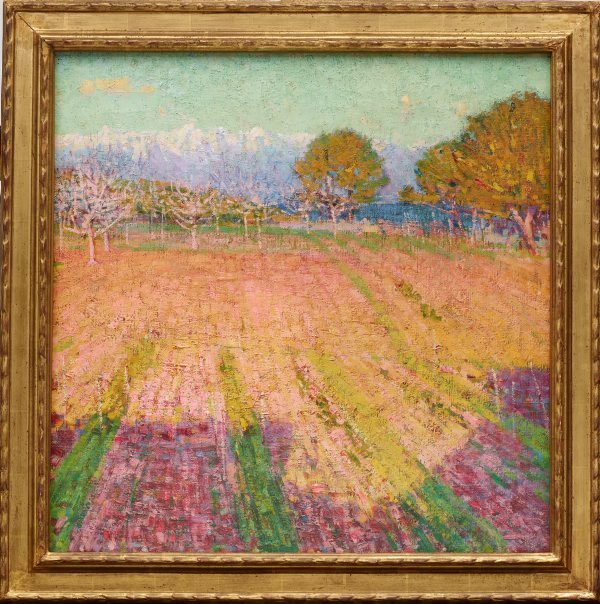 While already an experienced plein-air painter, Russell subsequently began experimenting with a looser more impressionist style, utilising diverse brush strokes, recording light and atmospheric effects, depicting everyday life and natural landscapes, and brightening his palette as he experimented with purer colours. Russell also knew many other Impressionist artists and their successors and he became the only Australian artist to work in a relatively pure French Impressionist style and technique, later developing his own more expressive and individual post-Impressionist style from the mid-1890s. 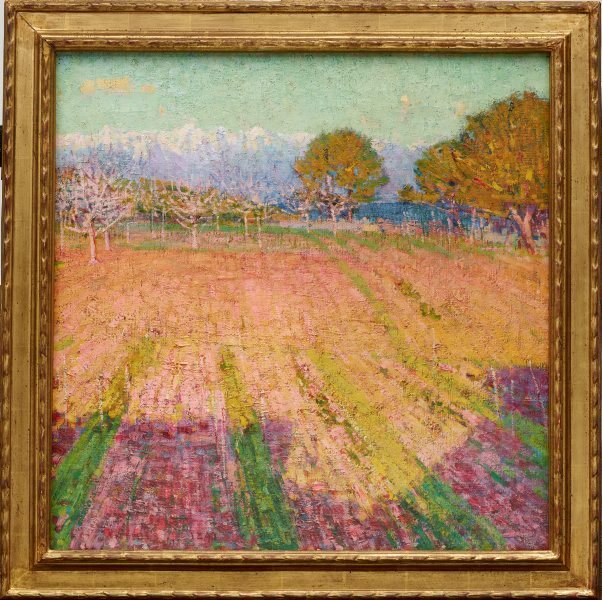 Russell's sojourn in Antibes in the winter of 1890-91 produced some of his most beautiful landscape paintings. Russell had seen Monet's 1888 Antibes paintings in Paris which he wrote to Van Gogh about, criticising their lack of form but admiring their colour. 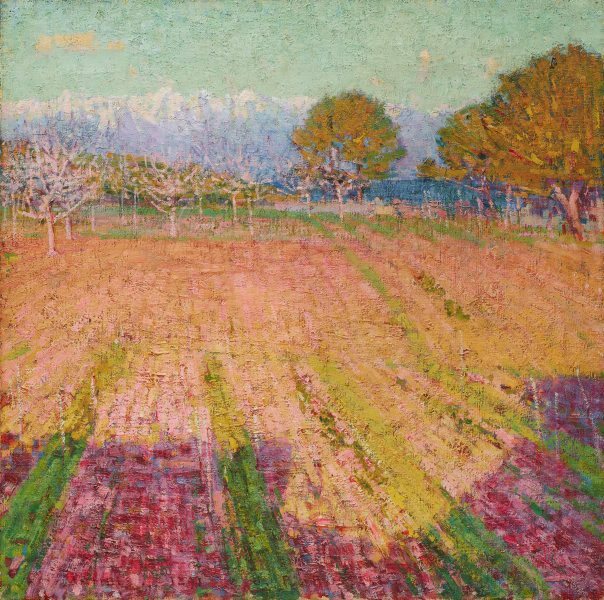 In Russell's own Antibes works he has synthesised Monet's techniques with an attention to form and is now working with pure colours that he may have been mixing himself. The strength of colour Russell experienced in the clear Mediterranean light is embodied in 'In the afternoon' where the purple shadowed foreground, orange midground, stripe of blue ocean, mauve and white Alpes-Maritimes, and intense turquoise sky epitomise Russell's exceptional engagement with colour at this time. Russell has thickly layered paint in a worked up surface in which colour is also experienced as texture, achieving an overall chromatic and visual intensity. While many Impressionist paintings appear spontaneous as the artist transcribes particular effects in front of the subject, in reality they are often highly considered and 'worked' compositions. 'In the afternoon' is no exception as conservation analysis has revealed an earlier version of this painting underneath in which the colour tones are lighter. Russell has allowed this to dry before painting over it to achieve the more intense colours in the final version. The reworking occurred soon after the first version as it is the colours and composition of the current painting that Russell describes in his letter to Tom Roberts in 1891. The complex interweaving of colours throughout the painting, but particularly visible in the fore and middle grounds, show an artist in full control of his technique to achieve the luminosity he sets out to convey. Signed bot.c., red oil "J.P. (illeg.)ll". Dated l.l., red oil "... 1891". Signed and dated upper c. verso on canvas, purple oil ".../ J P RUSSELL '91". Cicely Carr, Vanity Fair , 'A woman's diary', pg. 425-426, London, 28 Nov 1891, 425- 426. Ann Galbally, A remarkable friendship : Vincent van Gogh and John Peter Russell , 'Part III Towards utopia', pg. 171-244, Melbourne, 2008, 230-31. Wayne Tunnicliffe, Look , 'The lost impressionist', pg. 18-22, Sydney, Aug 2016, front cover (colour illus., detail), 5 (colour illus. ), 18 (colour illus. ), 20, 21, 22, 55 (colour illus.). Prue Viggers, Artemis , 'Art Gallery Society: reaching out', pg. 20, Newcastle, Feb 2017-Jul 2017, 20 (colour illus.). National Observer , 'The New English Art Club', pg. 86-87, London, 12 Dec 1891, 86. The Times , 'The New English Art Club', pg. 3, London, 30 Nov 1891, 3.